It is perhaps a bit of an exaggeration to describe my flat as having a dining room. There is certainly room to dine, but it is not a separate room from the rest of the flat. Instead, as the living area is open plan, I have used furniture to section off the study and both the sitting and dining areas. I have also used bunting in a blue, white and red theme to create a visual marker between the dining room and the kitchen. 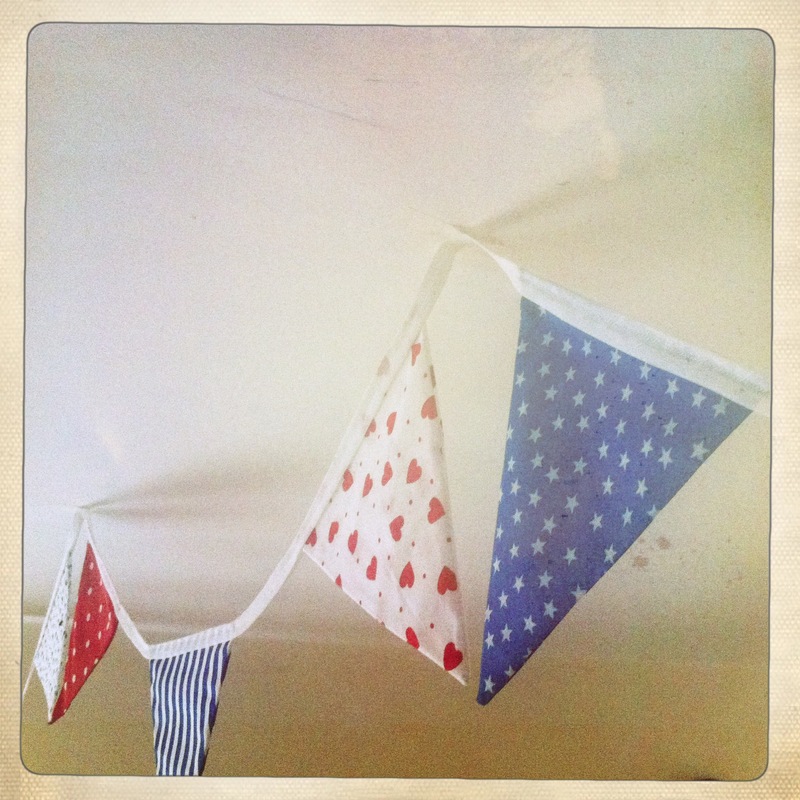 Use bunting to mark out different sections of a room in an open-plan space. 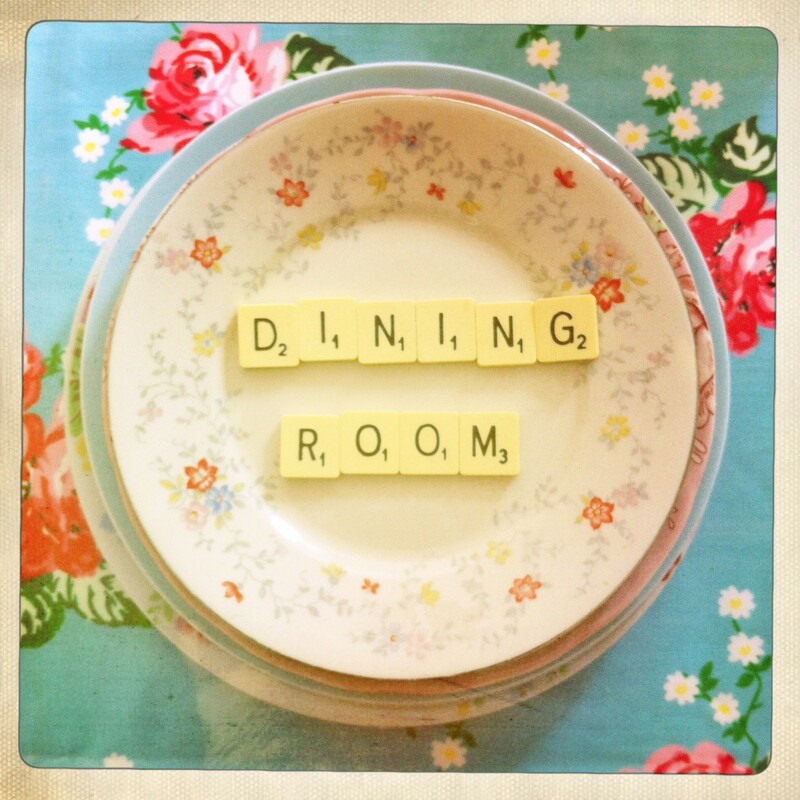 The dining table is a simple wooden IKEA table which cost less than £30. I bought this beautiful tablecloth several years ago when on holiday; it is oilcloth which makes it perfect for wiping up spills and crumbs. This gorgeous floral tablecloth works brilliantly with the pillar-box red painted chairs. Rather than wasting time separating cutlery into its separate sections in a drawer, all the cutlery is kept together in this candy-striped tin; everyone can help themselves to what they need, when they need it and it makes drying up much quicker. This painted tin provides a useful storage solution for cutlery. This gorgeous vintage radio was a Christmas present from my sister several years ago. We both loved it when we saw it in a Second hand shop, so had agreed that it would be fair if neither of us had it. However, unbeknownst to me, she later returned and bought it for me. It was a lovely surprise to open on Christmas morning! Sadly it doesn’t work, but I think it looks great in the dining room. This gorgeous old-fashioned radio is one of my favourite things in the flat. The dining chairs were a brilliant bargain: I bought 5 of them for £6 on eBay. They were old wooden school chairs and were very dusty and scratched when I bought them. I sanded them down and then painted them using Dulux gloss paint in a stunning pillar-box red. I bought 4 tie-back seat-cushions which have different patterns, but which work together with the bright red chairs and the vibrant tablecloth. Both eBay and Freecycle are excellent sites for local bargains – just remember to check ‘Collection Only’ on eBay and adjust the distance from your home postcode to refine your search area. Don’t be put off by what items might look like initially – try to see the potential in each piece and imagine what it could be like with a fresh coat of paint, or re-upholstering. Pretty polka-dot cushion covers in complementary colours. Pastel pink and cream cushions provide a comfortable seat at the table. Above the dining room table, there are two pictures: one is a copy of a self-portrait of Lucien Freud which I painted years ago when I did GCSE Art and the other is a postcard from the Guinness factory in Dublin which I visited a couple of years ago. Two different pictures hang above the dining room table. Interesting pieces of art don’t have to be expensive: I am always finding and collecting postcards or pictures in magazines, which look great when simply framed.